There is never a dull day in crypto land. If you’d like to catch up on the latest trials, triumphs, and curiosities facing the industry, read on. 1) Why are people calling this a bitcoin bubble? To be fair, it’s not just a bitcoin bubble, but rather a crypto bubble. The total value of all crypto assets as of today is in excess of $100B, up from a paltry $4B 1 year ago. No market increases by 25x that quickly without some degree of correction. But when and how deeply the price will drop is impossible to predict accurately. The peak could already be behind us, or many months ahead. Nobody knows for sure. 2) What is Ethereum and why are people talking about it? Ethereum is a decentralized platform that runs smart contracts. It is similar to Bitcoin in that it employs the use of a blockchain to record and execute transactions and scripts. Lately, the value of Ethereum has skyrocketed, along with many other alt coins, and rests today at about $33B vs. bitcoin’s $40B. Will the total value of Ether overtake bitcoin? Maybe, particularly in the short term. The odds should be assessed by looking at what is working for and against Ethereum. Pros: There is a considerable amount of brainpower engaged in the project. Likewise, it enjoys significant enthusiasm and consistently good publicity. Additionally, it is something genuinely new and exciting, with the potential to impact multiple industries - maybe even create new ones. Cons: There is a planned transition from the current proof of work (PoW) to a proof of stake (PoS) consensus algorithm that is all but assured, and if it does not come to pass, then the monetary base inflation of Ether will likely remain constant. 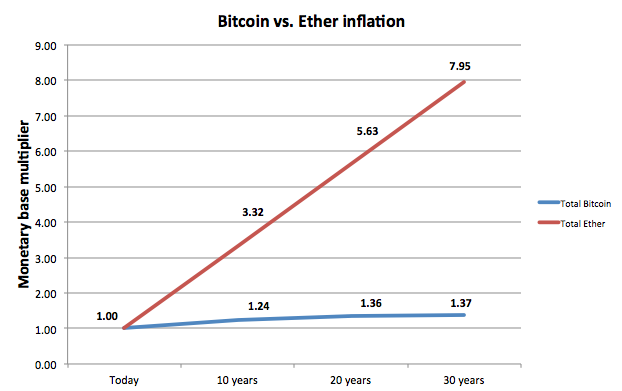 As an example, see below how over the next 30 years, there will be (compared to today) ~6 times more Ether in existence than Bitcoin, which features a steadily decreasing supply of new coins. This inflation presents a significant headwind to the price longterm, regardless of utility. To complicate matters further, Ethereum has its own scaling limitations, and fees are already rising in reaction to the current transaction/computation volume. 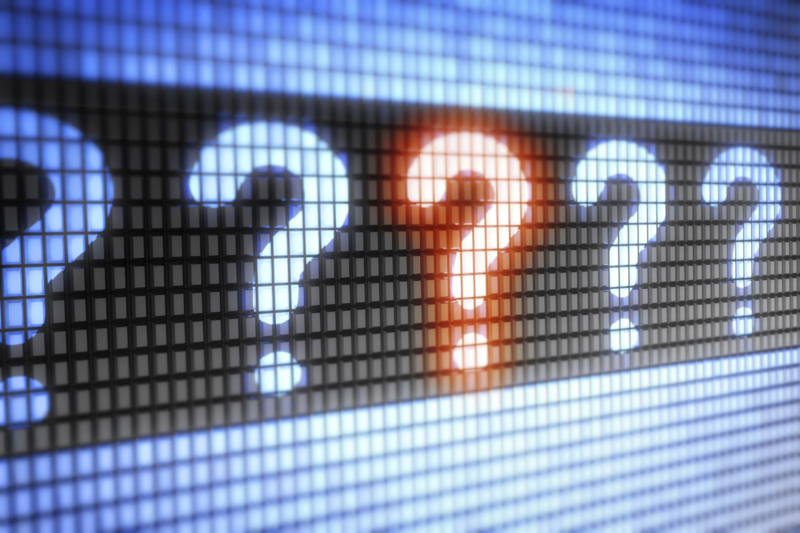 Proposals such as “sharding” may present a path forward, but are also yet to be successfully developed. Lastly, there remains the looming question about whether smart contracts are sufficiently useful to justify broad application in the future. 3) What are Initial Coin Offerings (ICOs)? Because of flexibility of Ethereum, companies can use something called the ERC20 token standard to issue various forms of equity, claims, and revenue sharing agreements. This has invited numerous ICOs, many of which collect funding in excess of $50M worth of cryptocurrency over short periods of time: days or even hours. The success with which the ICO model raises capital has caught everybody’s attention. So are they the future of funding, or outright scams? Yes. In other words, likely both. In the last 5 years globally there has been a noticeable trend away from traditional accredited investing and to crowdfunding. In the short term there are certainly inflated expectations of the viability—in particular the economic viability—of these projects. Most investors who participate today will sustain heavy losses. However, over time mechanisms and best practices are expected to improve, paving the way for more legitimate and accountable funding activities. 4) What is all this talk about scaling? Currently, bitcoin transactions are throttled by a self-imposed limit on the network. This was implemented to discourage bloating the blockchain with spam transactions. Now, there is sufficient “legitimate” transaction demand to fill the available capacity, and fees have risen as a result in competition for claiming a space on the blockchain. So will bitcoin scale? This depends a bit on your criteria for successful scaling. If you permit that the scaling can occur through the use of trusted third parties, then the answer is undoubtedly yes. It already scales in this way through peer-to-peer transactions using custodial wallets and exchanges. These transactions fall under the purview of the company that facilitates them, and they do not interact with the bitcoin blockchain, but they can be accomplished with zero or very small fees. With respect to on-chain or trust-less 2nd-layer scaling, the answer is “highly likely” although the time frame is unclear. Given the recent success of alt coins, much of which can be directly attributed to the bitcoin scaling stalemate, miners and developers are feeling pressure to come to an agreement and move the industry forward. Additional transaction capacity and reduced fees would breathe new life and enthusiasm into a community that has been stymied by opposing visions about the best path to pursue. 5) What will happen to Bitcoin on August 1st? This is a tough call. The problem is that there are many concurrent scaling proposals with varying degrees of support and potential effectiveness, the two most visible being SegWit2x and the BIP148 User Activated Soft Fork (USAF), which has a target activation date set for August 1st 2017. Without getting into the details in this article, we at breadwallet assign a low probability of two independent Bitcoin chains surviving, regardless of whether a hard fork occurs. The precise series of events that will take place around August 1st will create temporary uncertainty and potential disruption of the network. We’re monitoring the developments in this space closely, and prioritizing the security of our customers’ assets.